These are poses of men who know this game is ovah. Moving the Needle: Adrian Gonzalez caps the comeback with a double +.648 WPA. Last year was something of a blip. Boston went 9-9 against Baltimore after years of dominance (including 16-2 in 2009). Baltimore took the first series of the year two games to one, which meant that the Red Sox were, in the most fallacious way, due. The Orioles took a 6-0 lead, but in the bottom of the sixth the Red Sox rallied for five. 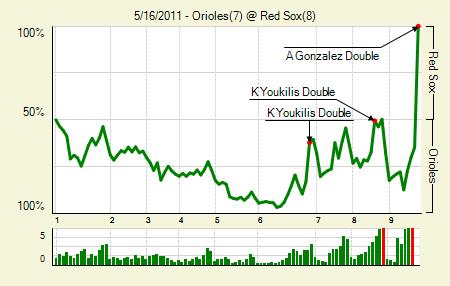 They then traded a pair in the seventh before Boston made its final move in the ninth. Kevin Gregg walked both Jacoby Ellsbury and Dustin Pedroia, and then served up a fat one for Gonzalez, who launched one off the monster and brought them both around. Kevin Youkilis: 2 for 4, 2 2B, 1 BB. That’s two doubles and two homers in his last four games. Also, each of the Red Sox first seven hitters drew a walk in the game. Vladimir Guerrero: 3 for 5, 2 2B. He’s 11 for his last 25 with five doubles and, gasp, a walk. Reports of his demise, greatly exaggerated, etc. Moving the Needle: Jason Bartlett adds a pair to the Padres’ total, +.086 WPA. The Padres were all over Armando Galrraga from the start. They loaded up the bases in the first and put across two. Then, in the second, they put men on second and third with one out, though in Galarraga’s defense an error helped that happen. But that gave Bartlett the opportunity, and he blasted one over Gerrardo Parra’s head to easily drive in both men. The Padres made it 5-0 before inning’s end, and were up 8-1 by the time Galarraga exited after the fifth. Chase Headley: 3 for 4, 1 2B, 1 BB. I’m not sure how much longer he can keep this up with his scrawny power numbers, but he’s drawing walks and the hits are dunking in. He really needed this kind of year. Justin Upton: 2 for 4, 1 HR, 1 BB. He had been 4 for his last 23 with no extra base hits. 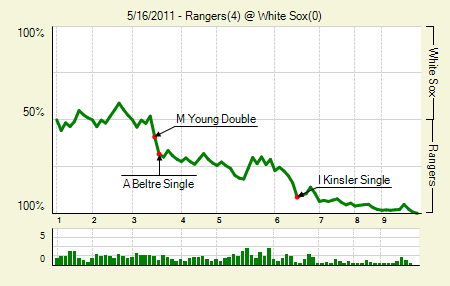 Moving the Needle: Michael Young doubles to get the Rangers started, +.111 WPA. After a scoreless pair to start the game, the Rangers made their move in the third. Endy Chavez led off with a single and later stole second, setting up Young’s RBI double. It would have ended the inning, which was unfortunate, because Adrian Beltre followed by ripping a single to left, making the score 2-0. The Rangers pitching pretty much cruised the entire game. Colby Lewis: 9 IP, 5 H, 0 R, 1 BB, 7 K. That’s a nice bounce back after his K-less outing last start. Endy Chavez: 3 for 5, 1 2B. He’s apparently the emergency leadoff man. Not bad for a veteran who spent the start of the season in the minors — and who hasn’t been in the majors since June, 2009. Moving the Needle: Eric Hinske brings home the go ahead run, +.209 WPA. There were actually three hits within .005 WPA of each other. The first came in the bottom of the sixth, when Joe Mather singled home the runners from second and third to make it 2-1. In the top of the seventh Matt Downs, who homered back in the fifth, doubled home the tying run. 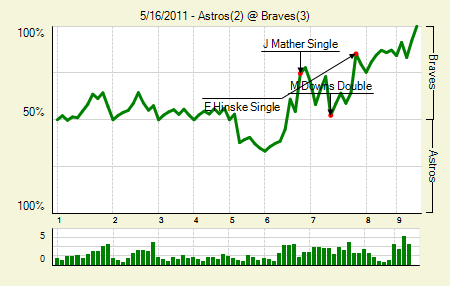 A half-inning later Hinske dunked one into right field, scoring Nate McClouth to reclaim the lead. Hinske was 3 for 3 on the night. Tommy Hanson: 7 IP, 3 H, 2 R, 1 ER, 1 BB, 10 K, 1 HR. That’s his second 10-strikeout performance in his last four starts. He has allowed just 15 hits in his last 25.2 IP. 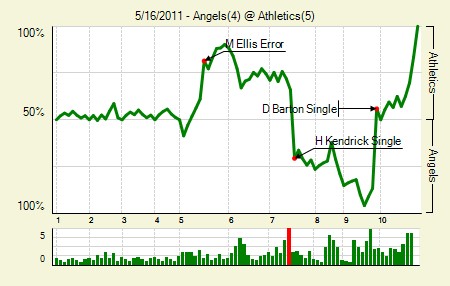 Moving the Needle: Aaron Hill brings home the go-ahead run, +211 WPA. The early season has been rough on Hill. He has a few more hits dunking in than last year, but he had just five doubles, and no homers, on the season, and has a 5% walk rate. The walk rate went down last night, but Hill did pick up a big RBI double in the eighth, staking the Jays to a 2-1 lead. 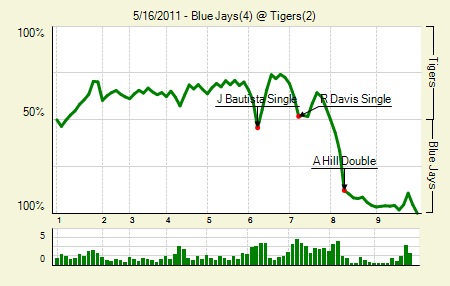 The Jays followed with a pair of sac flies to take the three-run lead, which came in handy later in the game. Joaquin Benoit: 1 IP, 4 H, 3 R, 3 ER, 0 BB, 0 K. I’m fairly certain that Benoit is better than this. Both his FIP and his xFIP are well below his ERA, and his strand rate is just 50.9%. Still, I’m having a hard time thinking about Benoit without also thinking of the contract he got at age 33, after what was by a mile the best year of his career. Kyle Drabek: 7 IP, 3 H, 1 R, 1 ER, 6 BB, 2 K. It’s remarkable that he limited the damage after all those walks. It’s also remarkable that he struck out only two, though his counterpart, Max Scherzer, also struck out only two in seven innings. Also, 0 for 2 on the Bautista checklist. Moving the Needle: Scott Rolen continues the sixth-inning rampage with a game-tying double, +.190 WPA. The great thing about MLB.tv is that you can jump to any half inning. If you have a couple of free minutes, I suggest watching the bottom of the sixth in Cincinnati. I won’t spoil it for you, but it involves a lot of hits right in a row, and it just keeps getting better. Anyway, Rolen’s double knotted the game at four and set them up for more. 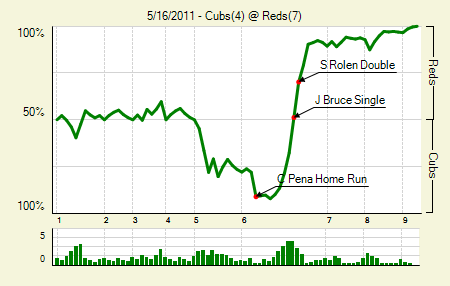 The sixth was, by the way, the only inning in which the Reds scored a run. Jonny Gomes: 1 for 4, 1 HR. That’s his seventh home run of the year, but his first since April 17th. Carlos Pena: 2 for 4, 1 HR. Two guys who badly needed to get off the schneid helped themselves in this one. Moving the Needle: Orlando Cabrera blah blah blah, +.123 WPA. In such a lopsided game you don’t expect much of a WPA swing. 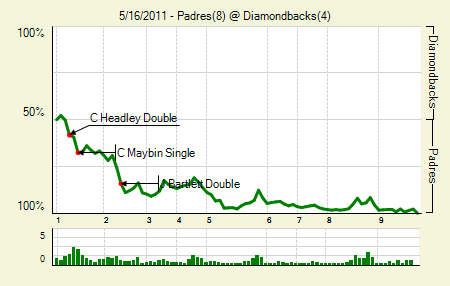 But when a single hit scores two runs in the first, you can get some decent needle movement. Orlando Cabrera provided that with his bases-loaded single, though it could have been more. 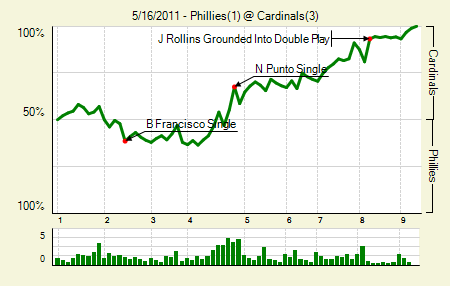 Carlos Santana got thrown out at third in the process, which ended the inning and thereby deflated the total win expectancy gain on the play. In any case, Vin Mazzaro was the story of the night, as I’m sure you’ve heard. I know I just said that the Reds’ sixth was the inning to watch, but that’s only if you have a few minutes. 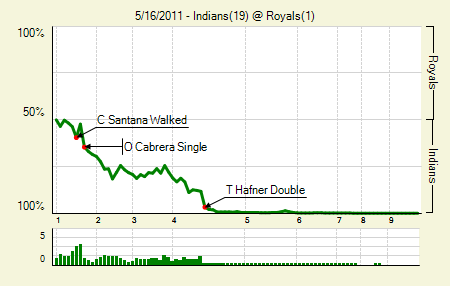 The Indians’ fourth is also an entertaining spectacle. Though it will take you quite a bit longer to watch. Michael Brantley: 2 for 4, 1 HR, 2 BB. Jack Moore has the scoop on Brantley’s breakout. Matt LaPorta: 4 for 4, 2 2B, 1 BB. The other piece in the CC Sabathia deal is also having himself a year. It only leaves me with the question of why a first baseman with a .369 wOBA and a .212 ISO is hitting friggin’ eighth, behind Travis Buck, in the lineup. Moving the Needle: Carlos Gonzalez breaks the tie in a big way, +.294 WPA. Seriously, the Rockies needed this one. They had just been swept by the Giants last week, and had lost 10 of their last 13. Heading into the sixth they held a 2-1 lead, but the Giants hit a pair of homers to go up 4-2. 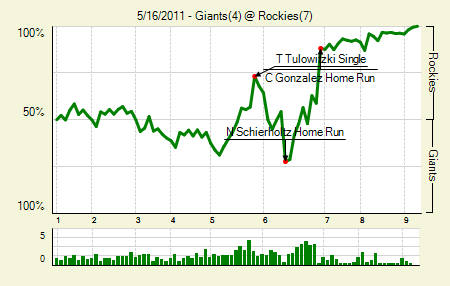 But the Rox battled back in the bottom half, tying the game before Gonzalez took Tim Lincecum way deep to center field. That gave the Rockies not only the lead, but some breathing room. Dexter Fowler: 2 for 3, 2 BB. The power hasn’t been there at all this year, but he has a 15% walk rate, which leads to a .374 OBP. That’ll do for a leadoff man. Jose Lopez: 2 for 3, 1 2B, 1 BB. That’s his first extra base hit in nearly a month (April 17th). He really needed this one, as his short tenure in Colorado has gone about as poorly as possible. Moving the Needle: Jack Cust opens the game with an RBI double, +.134 WPA. This game unfolded quite slowly, but there was some excitement in the first. Cust blasted a double out to right, which hit the warning track and then the top of the wall, making it a tougher play for Jason Kubel. 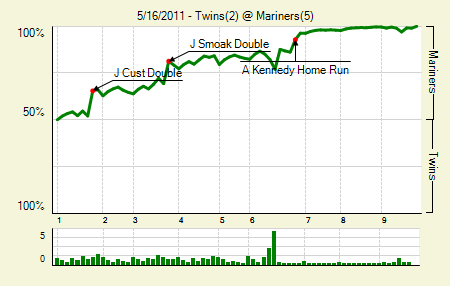 That gave Chone Figgins enough time, though just barely, to score from first. The M’s then added a run in the third, and then two in the sixth, which, against the Twins offense, basically assured victory. The Twins did, however, scrape together two runs in the ninth. Maybe that’ll help get them kick started for tomorrow. Justin Smoak: 1 for 3, 1 BB. He now holds a .404 wOBA. He is who we thought he was? Michael Pineda: 7 IP, 3 H, 0 R, 1 HBP, 7 K, 9 GB. He has gone at least six innings in each of his eight big league starts. Moving the Needle: Rickie Weeks puts the Brewers ahead with a single, +.165 WPA. 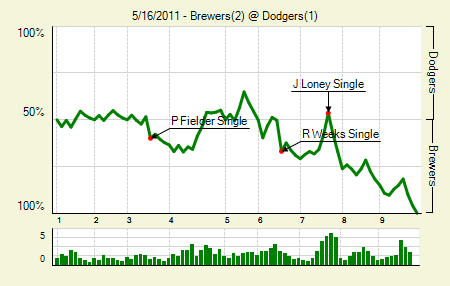 With the game tied at one in the top of the sixth, the Brewers had runners on first and third with two outs. Weeks got his big chance, and he shot one between short and third to bring home that go-ahead run. That was about all the scoring this game could handle. Shaun Marcum: 7 IP, 5 H, 1 R, 1 ER, 1 BB, 4 K. It feels as though he’s starting to make the notables section every start. Moving the Needle: B.J. Upton caps the rally with a go-ahead homer, +.369 WPA. It all happened so quickly. A double and a Sam Fuld homer opened the sixth inning, but then A.J. Burnett got the next two. 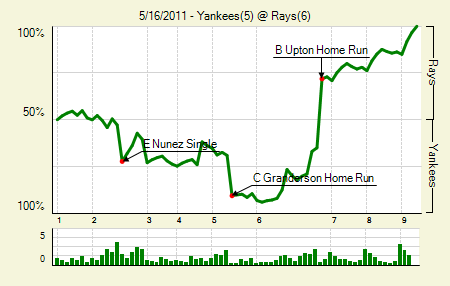 But then three straight hits, the last being Upton’s homer, put the Rays up 6-5. Their bullpen took it from there, running through the remaining Yankees in order to finish out the game. Curtis Granderson: 1 for 4, 1 HR. He’s still two behind Jose Bautista, who did not homer today. Moving the Needle: Danny Espinosa breaks the tie in the seventh, +.297 WPA. 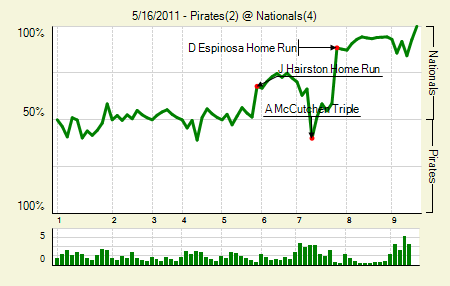 The Pirates had worked so hard to tie the game in the top of the seventh, only to see it ruined in the bottom half. Actual announcer’s quote re: Espinosa mere seconds before he hit the homer: “The challenge for him: do something left-handed.” He has really fallen off after a strong start; that was only his second hit in the last seven games. The Nats’ bullpen took the handoff and ran the rest of the way to the W.
Ronny Cedeno: 2 for 3, 1 2B, 1 BB. Ronny! Two doubles in two days. It would be more remarkable, I guess, if he hadn’t done it already this season. But still! Two doubles in two days from Ronny Cedeno. He’s actually gotten his wOBA up to .251, which is a far cry from last week, when, for one day at least, he had the worst wOBA among qualified position players. John Lannan: 6.1 IP, 7 H, 2 R, 2 ER, 4 BB, 4 K, 0 HR. For Lannan, this is pretty much as good as it gets. His last two, in fact, have been good as it gets. they also featured 1:1 K/BB ratios. Moving the Needle: Burke Badenhop drives in the go-ahead run, +.373 WPA. 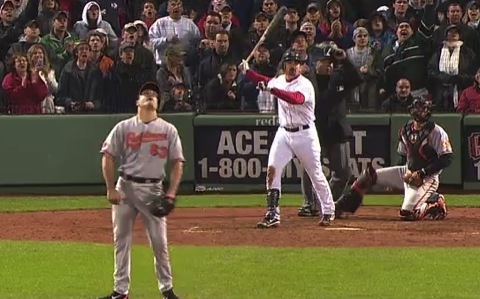 What was the pitcher doing hitting for himself in that spot? Well, there wasn’t really anyone left to pinch hit for him. Even the backup catcher was already in the game. But that’s fine. 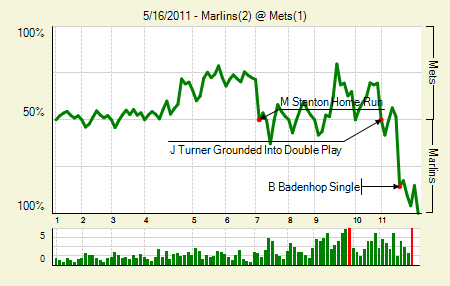 Badenhop worked the count full and then shot one past a diving Justin Turner to bring home the eventual winning run. Speaking of Turner, he drove in the Mets’ only run in the fourth, but then caused the biggest negative WPA swing of the game when he grounded into a double play with men on first and second in the 10th. Mike Pelfrey: 7 IP, 6 H, 1 R, 1 ER, 2 BB, 1 K, 1 HR. Giving up a homer to Mike Stanton is forgivable. Omar Infante: 3 for 4. Of course, the Marlins failed to bring him around on any of his three trips to first base. Moving the Needle: Nick Punto delivers a bases-loaded RBI, +.124 WPA. When I first watched the replay, I honestly thought the second runner was on his way home. But no, it was Holliday, the lead runner, and he damn nearly got forced out at the plate. Apparently he held up, thinking that Ben Francisco might catch Punto’s soft liner. I imagine there would have been much flipping out in St. Louis had the throw beaten Holliday. The Cardinals actually plated the go-ahead run that inning, too, but it was only +.063 WPA on account of Yadier Molina getting thrown out at the plate. Jake Westbrook: 7 IP, 4 H, 1 R, 1 ER, 3 BB, 1 K, 0 HR, 13 GB. I love looking at a pitcher’s line and knowing that when I scroll down to More Batted Ball I’m going to see a whole heap of ground balls. Jimmy Rollins: 2 for 4, 1 2B. That’s his third double in his last four games. Moving the Needle: Daric Barton ties the game in the ninth, +.426 WPA. The A’s jumped out to an early lead, but the Angels battled back in the middle innings and finally took the lead in the seventh. They had one last chance against Angels closer Jordan Walden in the ninth, and they took advantage. A two-out single, stolen base, and another single tied the game, which set off Mark Ellis’s walk-off — though it was nothing too impressive. Just a really weak bouncer and a poor throw from Howie Kendrick. Coco Crisp: 2 for 4, 1 2B, 1 BB. His single and stolen base made the 9th inning comeback possible. Joel Pineiro: 7 IP, 6 H, 3 R, 1 ER, 2 BB, 3 K, 0 HR, 13 GB. He’ll either be a great help to the Angels’ chances in the West or else a valuable trade chip at the deadline. We hoped you liked reading The Morning After: Game Recaps for May 16th by Joe Pawlikowski! Wow. So many great games last night.